HAMBURG, Germany, Dec. 20, 2018 /PRNewswire/ -- The local government of southeast China's Ganzhou City in Jiangxi Province and Ganzhou Tourism Development Committee held a city tourism promotion event in Germany's Hamburg. Known as the "Orange Capital of the World" and an ecologically advanced city, Ganzhou aims to draw more tourists and boost friendly exchanges with the German port city. 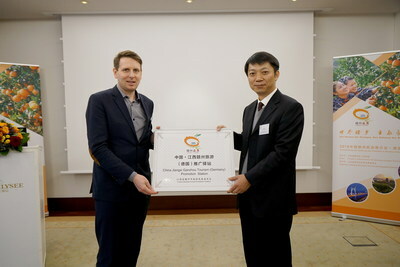 At the promotion event, Liu Wenyan, head of the Ganzhou Tourism Development Committee, offered licenses to German tourism agencies for qualifying for offering inbound tourism services into China. "Located on the coast of the North Sea, Hamburg is Germany's gateway to the world and a bridgehead for Sino-German cooperation to promote the Belt and Road Initiative. Ganzhou, on the other hand, is also an important city in the Belt and Road region, and launched its train service to Hamburg in 2017, opening a new chapter in economic and trade exchanges between the two places," said Guo Sufang, deputy mayor of Ganzhou. "I hope that this promotion event will further promote the cooperation between the two cities and the two countries in the tourism industry, so that mutually beneficial and common development will be achieved," Guo added. Established in 1973, the Hamburg China Friendship Association is the oldest of its kind in the city, according to Dr. Jens-Christian Posselt, director of the association. "Both Ganzhou and Hamburg are waterside cities, with the Ganjiang River winding through Ganzhou while Hamburg being a port city and known as the 'City of Bridges'," he said. So he brought a Hamburg sailing boat model as a gift to the people of Ganzhou. "May this sailing boat carry the friendship of Ganzhou and Hamburg people and sail afar," he added. A licensing ceremony was also held at the promotion event. Liu Wenyan, head of the Ganzhou Tourism Development Committee, offered licenses to German tourism agencies for qualifying for offering inbound tourism services into China. The two sides agreed to carry out in-depth cooperation in the joint development of the Ganzhou tourist route and better publicity of Ganzhou tourism. After the promotion event, attendees enjoyed a photo exhibition highlighting the features of Ganzhou as an old Chinese revolutionary base, cradle of the Hakka people, ancient Song Dynasty city in the south of the Yangtze River and an ecologically advanced city. BEIJING, Dec. 20, 2018 /PRNewswire/ -- China New Borun Corporation (NYSE: BORN; "Borun" or the "Company"), a leading producer and distributor of corn-based edible alcohol in China, announces today that on December 19, 2018, it received notice from the New York Stock Exchange ("NYSE") that the Company did not meet the NYSE's price criteria for continued listing standard because the average closing price of the Company's American Depositary Shares, or ADSs, was less than $1.00 per ADS over a consecutive 30-trading-day period. The Company expects to cure this deficiency within the prescribed timeframe and will duly notify the NYSE of its intention. The Company's ADSs will continue to be listed and traded on the NYSE, subject to compliance with other NYSE continued listing standards and oversight by the NYSE. The Company is currently in compliance with all other NYSE quantitative continued listing standards. The NYSE notification does not affect the Company's business operations or its Securities and Exchange Commission reporting requirements. China New Borun Corporation (NYSE: BORN) is a leading producer and distributor of corn-based edible alcohol sold as an ingredient to producers of baijiu, a popular grain-based alcoholic beverage in China. The Company also produces DDGS Feed, liquid carbon dioxide and crude corn oil as by-products of edible alcohol production, and chlorinated polyethylene (CPE) that are widely used in chemical industries. China New Borun is based in Shouguang, Shandong Province. Additional information about the company can be found at http://www.chinanewborun.com and in documents filed with the U.S. Securities and Exchange Commission, which are available on the SEC's website at http://www.sec.gov. All statements included in this press release, other than statements or characterizations of historical fact, are forward-looking statements. These forward-looking statements are based on our current expectations, estimates and projections about our industry, management's beliefs, and certain assumptions made by us, all of which are subject to change. Forward-looking statements can often be identified by words such as "anticipates," "expects," "intends," "plans," "predicts," "believes," "seeks," "estimates," "may," "will," "should," "would," "could," "potential," "continue," "ongoing," similar expressions, and variations or negatives of these words. These forward-looking statements are not guarantees of future results and are subject to risks, uncertainties and assumptions that could cause our actual results to differ materially and adversely from those expressed in any forward-looking statement. 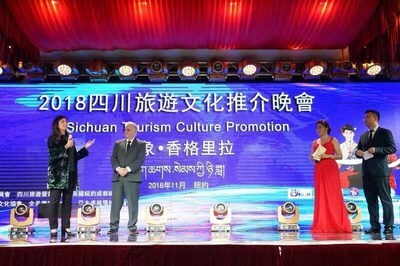 CHENGDU, China, Dec. 20, 2018 /PRNewswire/ -- On Novem­ber 26th 2018, the Sichuan Tourism Admin­istration hosted an art and culture gala in Flushing, New York to celebrate and introduce the great achievement of western Sichuan tourism since the Chinese policy of reformation and opening 40 years ago. More than 200 distinguished guests including congressmen and business elites attended. Large-scale performances of folk music from China let audiences experience a visual cultural tour of the region. One of the audience members was even lucky enough to win round-trip tickets between Chengdu and New York. Sich­uan Province and Aba Tibetan Autonomous Pre­fecture are inviting more west­ern tourists to discover the treasure of their splendid beauty. Tourists may already be famil­iar with pandas, Mount Emei, Chengdu and the region's gastronomy, but Sichuan is also inviting visitors to Jiu Zhai Gou Valley and Gongga Mountain and to experience the lifestyle and culture of ethnic groups like the Qiang of Tibet. Jiuzhaigou Valley, a famed world her­itage site and national park, is regarded as a beautiful destination. Getting its name from having Nine Tibetan Forti­fied Villages, Jiuzhaigou features 118 mineral lakes, riv­ers and waterfalls, all mesmerizing visitors with their various shades of blue. Recognized for its beauty in the 1970s, it became a national park. It was awarded the status of UNESCO Man and Biosphere Reserve in 1997 and was also recognized as a UNES­CO World Heritage Site in 1992. There are loftier landscapes still in the Aba Tibetan Autonomous Pre­fecture, northern Sichuan, where the elevation rarely drops below 2,500m. Its highest point, Gongga Mountain, is 7,556 meters above sea level, 2,749 meters higher than Mount Blanc, the peak of the Alps. Ruoergai Prairie, also known as Ruoergai Wetland, is one of the top three wetlands in China and provides vast green landscapes along the bor­der of northwestern Sichuan. The Ruoergai Grassland consists of meadows and marshes and seems flat and endless. Also of interest is Yading. Yading is located in southern Dao-cheng County. The Yading Nature Re­serve has an average elevation of well over 4,000 meters. Inside the Yading Nature Reserve are the 3 holy moun­tains of Chenrcsig, rising to 6,032 me­ters, and Chana Dorje and Jampelyang, which both rise to 5,958 meters. These 3 snow-capped peaks sit in a triangle formation with forested valleys, clear rivers, glacier-fed lakes and abundant wildlife between them. The host of the New York event said this gala aimed to continue deepening exchanges and cooperation in economics, culture, tourism and other areas between China and the United States. BALI, Indonesia, Dec. 20, 2018 /PRNewswire/ -- Sthala, a Tribute Portofolio Hotel, Ubud Bali - Marriott International is presenting a magical repertoire of Festive Season 2018 program, designed to create an unsurpassed holiday experience. Located about 60 minutes from the Ngurah Rai International airport, the hotel rests among the tropical landscape in Lodtunduh, Ubud and is perched on a hilltop, offering stunning ridge-views of the steep river valley and lush forestry. Sthala Ubud Bali escalates the festive season to the next level by combining the cultural and tropical setting with jovial festive vibe. Selection of room packages specially curated for holiday makers are available for booking. Sthala Ubud Bali also takes diners on a culinary journey around the globe that takes in Asian, Indonesian and International cuisines with aim to pamper each unique palate through extravagant buffet fiesta. As the starry night draws in, relish the extensive Xmas Wonderland Buffet Dinner in the heart-warming Ubud ambiance. Savor the delightful cutlets of spring lamb on saffron and braised beef bourguignon to pamper the diners' palate. Meanwhile the carvery station will be serving the oozing oven-baked honey glazed leg of gammon ham and traditional roast turkey with chestnut, corn stuffing and cranberry sauce. Do not forget to taste our delectable Indonesian selections such as the succulent and rich beef rendang and opor ayam. As for the dessert aficionados, indulge one's sweet tooth with a bundle of sweets such as homemade Christmas pudding, Christmas Stolen, chocolate truffle cake and dozens of chocolates and marshmallows. Our signature Gingerbread house and "choo choo" train full of treats will be featured to add the spectacle of holiday sweetness. Not to forget that the dinner will be accompanied by special appearance by Santa Claus, Christmas choir and live musical performance to carol around at Sungai Restaurant. Celebrate the joyful spirit season of Christmas and discover indulgence in a tranquil setting by staying at Sthala Ubud Bali with our Xmas Wonderland - 3 days 2 nights package. Included in the package are an extensive array of wonders, benefits and surprises such as 2-night stay at Deluxe room, daily breakfast for 2 people, Santa's giveaway, Gingerbread House and "Choo Choo Train", Xmas Wonderland Buffet Dinner for 2 people on Christmas Eve, daily morning yoga by the river, village cycling and many others for the visitors' truly Christmas wonderland experience. For those who want to store their Christmas gifts for their loved ones and wish for Santa to delivers it, there will be Christmas Gift Counter open daily at our lobby area. Enjoy the exquisite New Year Gala Buffet Dinner at Sungai Restaurant featuring both International and Asian cuisines with additional live cooking stations. Followed by loads of sweets at the dessert bar and countdown "Retro 4.0" NYE Party at Naga Rooftop Bar & Lounge where Turah the Saxophonist and DJ MT will spin their tunes together and keep the guests entertained and dancing all night. The party will apply dress code of retro look and there will be a special prize for the best outfit of the night. Escape from the hustle and bustle of city crowd to the heart of Ubud, where adventures and enthralling landscape awaits at Sthala Ubud Bali. Celebrate the new year with Sthala and rejuvenate visitors' own soul, mind and body with our vast range of curated activities. Included in visitors' stay, are 2-night stay at Deluxe room, daily buffet breakfast for 2 people, complimentary guest activities, New Year's Eve Buffet dinner for 2 people and countdown "Retro 2.0" party Turah the saxophonist and DJ MT on the stage playing favorite tunes all night long. After a heavy night celebrating, wind down the next morning at Sungai Restaurant for heavenly New Year Buffet Brunch with a vast range of fresh seafood, pasta selections, succulent carvery, delectable cold and hot dishes as well as sumptuous dessert in a laid-back ambiance of Lodtunduh village. Alongside the aforementioned offerings, ranges of other packages are also available at Sthala, a Tribute Portofolio Hotel, Ubud Bali by Marriott International. For further information and reservations please contact Sthala, a Tribute Portofolio Hotel, Ubud Bali by Marriott International at +62 361 301 8700, email at: resv.sthala@tributeportfolio.com or alternatively via the website: www.marriott.com/dpstp. Sthala Ubud, a Tribute Portfolio Hotel, Bali, member of Marriott International Hotel is located about 60 minutes from the Ngurah Rai International airport. The hotel rests among the tropical landscape in Lodtunduh, Ubud and is perched on a hilltop, offering stunning ridge-views of the steep river valley and lush forestry. Featuring 143 Deluxe rooms and Suites, with a spacious living area and balcony, most rooms provide a commanding view of the Wos River or surrounding areas. This upscale hotel features a design narrative that focuses on traditional Balinese elements while blending seamlessly with the natural surroundings of this picturesque location. Launched in April 2015 as Starwood's 10th brand and second collection of independent hotels, Tribute Portfolio is comprised of exceptional independent hotels around the globe, offering guests and owners the ability to "Stay Independent." From boutique resorts to urban destination properties, guests can enjoy access to outstanding upper upscale hotels with an indie spirit while benefitting from the award-winning Starwood Preferred Guest (SPG) program. For more information on Tribute Portfolio, please visit www.tributeportfolio.com. Follow along to Stay Independent: @TributePortfolio on Instagram, @TributePRTFLO on Twitter, www.tributeportfolio.tumblr.com and www.facebook.com/TributePortfolio. BEIJING, Dec. 20, 2018 /PRNewswire/ -- Link Motion Inc., (NYSE: LKM) ("Link Motion" or "the Company"), a leading smart car and smart ride company, today announced a certain change to its board of directors. Today, the Company announced that Mr. Larry Chi, Co-Chairman of the Company, has resigned from the Company's board of directors due to personal reasons, effective as of December 19, 2018. Mr. Chi informed the Company that his resignation did not result from any disagreement with the Company on any matter relating to the Company. SHENZHEN, China, Dec. 20, 2018 /PRNewswire/ -- China (Shenzhen) International Gifts, Handcrafts, Watches & Housewares Fair (Gifts & Home China/the fair), hosted by Reed Huabo Exhibitions and established in 1993, is China's pioneer and most established consumer goods trade show. It's a 4-day professional trade show with multiple industry seminars and gathering activities. The upcoming edition will be held from April 25-28, 2019 at the Shenzhen Convention & Exhibition Center. Exhibiting at this fair is an effective option for foreign companies to meet the ideal business partners and buyers in China, and a cost-effective way to start and expand a business in China. China is known as a major supplier of all kinds of products; however, with its rapid economic growth, China is shifting to a major consumer market of the world's products. With the second largest aggregate economy and a substantial growth in income, people in China spend much more money than ever before. Overseas products with good designs and quality are especially in demand, meaning now is the best time for overseas companies to tap into the great emerging opportunities in China. LANGKAWI, Malaysia, Dec. 18, 2018 /PRNewswire/ -- After 25 years in an expansive site of more than 46 acres, The Datai Langkawi is ready to reveal its newly refurbished interiors and facilities, without compromising the Datai's DNA, following a 12-month renovation programme. Nestled in the heart of a 10-million-year-old rainforest, when the late Australian architect Kerry Hill envisioned The Datai Langkawi's main building, on a forest ridge 40 metres above sea level and 300 metres away from the ocean, it was initially met with bewilderment. But he stood his ground, determined to preserve the pristine beauty of the coastline and unveil the hidden treasures of the rainforest. Assisting him was designer Didier Lefort of award-winning Paris-based design studio DL2A. Today, the legacy of the extraordinary resort on the island of Langkawi, set in the heart of a virgin rainforest, has been reimagined into a global icon for new generations since its inception in 1993. "The vision was very clear from the start," says Arnaud Girodon, General Manager. "We wanted to refresh the spaces whilst maintaining the signature Datai DNA. We made sure local materials and inspiration from the environment, surroundings and culture were used so our regular guests will still feel very much at home when they return. We have ensured to preserve what our guests have always loved about the resort and also created incredible new experiences for them to discover. We are ready to embark on a new chapter for The Datai Langkawi and are looking forward to the journey." Interior designer Didier Lefort adds, "It was important to maintain a deep connection to the original vision of a luxurious retreat seamlessly integrated into the 10-million-year-old virgin rainforest. The approach marries simplicity, modernity and creativity with inspirations from the local environment, culture and materials. Accommodation is refreshed with lighting enhancements and a warm, sophisticated colour palette while the addition of the latest technology ensures the ultimate in contemporary comfort, with the signature Datai DNA still evident throughout." The resort has 121 rooms, suites and villas, all with enchanting views of the lush tropical rainforest, some with the breath-taking vista of the Andaman Sea with Tarutao Island on the horizon. Escape to the perfect seclusion of a private sanctuary with the resort's Canopy, Rainforest or Beach Collection. Canopy Collection -- Situated in the main buildings, the Canopy Deluxe and the Canopy Premium rooms are a delightful way to experience The Datai Langkawi and its stunning views and award-winning architecture. Perfect for guests who prefer to be near the spectacular main pool, The Dining Room and The Lobby Lounge. The Canopy Suites offer rare rainforest views from their spacious balconies, and also feature a separate living room with dining area and a very large bedroom. At 378 square metres (approximately 4,068 sqft), The Datai Suite is bathed in natural light, boasting unobstructed views of the rainforest and the Andaman Sea from an outdoor private veranda. The spacious indoor living space is furnished with neutral tones and elevated amenities. Rainforest Collection -- Tucked deep inside the lush tropical rainforest and the vegetation that covers The Datai Langkawi terrain estate, the elegant Rainforest Collection villas, including some with 10-metre infinity pools, are architecturally designed to be naturally at one with Mother Nature. Standing proudly on stilts, The Rainforest Villas and Rainforest Pool Villas will either offer scenic views of dense jungle in abundance or a tropical stream flowing along a meandering course. The Datai Estate Villa -- The Datai Estate Villa deserves a prominent introduction as the resort's newest addition; with its expansive five-bedroom facility, spanning 3,500 square metres (approximately 37,700 sqft). The exclusive space features alluring neutral tones with modern furnishings, living rooms, game rooms, two 20-metre connected pools, 24-hour butler service, as well as a private chef. Beach Collection -- Located directly on the pristine white-sand beach of Datai Bay, the One-Bedroom Beach Villas and the Two-Bedroom Beach Villa are fully enclosed with serene garden views and inviting private swimming pools. The Beach Villas appeal to guests seeking privacy with personalised service from their butler. The Gulai House -- Serving authentic Malaysian cuisine, The Gulai House is an award-winning restaurant tucked deep in the rainforest. The restaurant is reminiscent of a traditional Malay kampung (village) house where diners are welcome to bersila (sit on the floor) or at the rustic dining table to enjoy a Malaysian feast. A traditional hand-washing ritual is performed at the start of every meal. The Pavilion -- The signature Thai restaurant overlooks the serene tropical surroundings. Situated atop 30-metre stilts with far reaching views of the rainforest, Thai cuisine is celebrated with freshly harvested exotic herbs. The sight of the elusive flying colugo, a gliding mammal, will enhance any dining experience. The Dining Room -- A lavish spread for breakfast awaits diners, complete with a juice bar, freshly made pastries and breakfast specials. Lunch is served à la carte. The restaurant transitions into a romantic venue in the evening, serving French fine dining. Wine aficionados will delight in the restaurant's exclusive wine collection from its walk-in wine cellar. The Beach Club and The Beach Bar -- A casual venue to enjoy convivial gatherings. Spend the day sipping signature cocktails and savouring fresh seafood, served from an outdoor show kitchen and an open grill, while sunset lights up the horizon with red and orange. At dinner, The Beach Club restaurant transforms into an elevated seafood grill restaurant with tables set on the various decks where guests can listen to the soothing sounds of the waves. The Lobby Lounge -- Overlooking the Andaman Sea and the rainforest, this open-air lounge is the ideal place to relax and take in the panoramic views. Delicious light snacks are available throughout the day and a premium selection of teas is served during the afternoon high tea. A splendid selection of cocktails, refined spirits and champagne is available in the evenings accompanied by a tapas menu and a live jazz duo. Private Dining -- To celebrate a special occasion, the resort can create a bespoke dinner experience, surrounded by the lush rainforest as the backdrop or directly on the white sandy beach. The Datai Langkawi’s private footpath leads to dreamy Datai Bay’s idyllic white-sand beach, which was voted as one of the World’s Top 10 Beaches by National Geographic. The resort also sits in extraordinary biodiversity and the 10-million-year-old rainforest is home to a wealth of flora and fauna. Against a backdrop of Southeast Asia’s oldest mountain, Machincang, its 750-hectare rainforest ‘back garden’ is every nature lover’s dream, just waiting to be discovered. The Nature Centre -- The design of this unique open-air structure is inspired by a tribal bamboo longhouse. There is a library full of references to the natural world of Langkawi and Malaysia, as well as a lounge for guests to sit and listen to stories from the wild by Mobarak and his team. There is also a Tea Corner serving specially curated teas by Dr. Ghani, Langkawi's well-known traditional Malay medicine guru, using herbs and spices from plants native to the rainforest. These concoctions are not only delicious but also good for one's health. Nature activities -- In addition to the many activities at The Datai Langkawi, the newest trail -- The Rimba Trail -- will have guests enjoy an informative walk that will transition from a coastal forest, on to a 70-metre-long elevated walkway over a mangrove habitat. The journey continues through a lowland rainforest, the highlight of which is a 23-metre-long, 18-metre-high Canopy Walk. There is also a selection of nature activities for children to discover. To protect this unique natural habitat, sustainability is also a key component of the resort's strategy with a strong commitment to using less energy, water and single-use plastic. For example, guests are provided with stainless steel drinking flasks for excursions to replace single-use plastic water bottles; sustainable bamboo toiletries are used in all rooms; and drinking straws are made of 100-percent natural bamboo or stainless steel. The Hotel produces its own water from the newly-introduced water bottling plant. The Permaculture Garden is a self-sustaining, zero-waste, organic food production system. Its visitors can discover how saplings and seeds are saved at the Seedling Hut and learn about permaculture in the Outdoor Classroom. At the Organic Wealth Centre, organic waste is transformed into nutrition for the garden at the Worm Farm, where the worms decompose buffalo manure and food waste to produce bio-fertiliser. In harmony with the resort's unique natural surroundings, well-being at The Datai Langkawi means embracing the healing properties in plants found in the rainforest in accordance to age-old traditions and philosophies of the Malay culture known as Ramuan. A unique Malay concept, Ramuan, is referred to as the gathering of medicinal plants in its purest essence. The Spa is situated along a small winding stream surrounded by the sounds and subtle aromatic scent of the rainforest. Focusing on aligning wellness with nature, The Spa has five treatment villas and one studio. The philosophy of beauty through health is complemented by the international expertise of Bastien Gonzalez and Phyto 5. Bastian Gonzalez is renowned for his exceptional virtuosity and approach to hand and foot care, while Phyto 5's innovative skincare delivers the ultimate holistic skincare experience. The Els Club Teluk Datai -- Golf legend and course designer, Ernie Els, launched this spectacular scenic golf course in 2014. The 18-hole, par-72 championship golf course elevates The Datai Langkawi experience by providing a world-class arena for golfers and outdoor enthusiasts. Water sports and recreation -- The pristine beach and azure waters invite guests to explore intricate marine life by snorkeling, kayaking, windsurfing or sailing. The Health Club -- Work up a sweat while enjoying magnificent views of the Andaman Sea. The facility features a range of the latest indoor and outdoor sports equipment for tennis and cycling. The Boutique -- An extensive collection of locally inspired merchandise crafted by Malaysian artisans and designers. The Atelier -- In an effort to promote Malaysia's arts and crafts to our guests, The Atelier provides a space for Malaysians artists to exhibit their creative artworks and conduct workshops or classes to share their techniques with guests. For more information or reservations, visit www.thedatai.com, email reservations@dataihotels.com or call +60-4-9500-500. For high-res images and more information on The Datai Langkawi, please click here. One of the world's most stunning resorts, The Datai Langkawi is situated on the northwest tip of the island Langkawi in Malaysia. Located in a 10-million-year-old rainforest rich in wildlife and overlooking the tranquil Datai Bay that has been awarded by National Geographic as one of the Top 10 Beaches worldwide, the iconic property enchants with mesmerising nature, visionary architecture, luxury and bespoke service. All of the 121 rooms, villas and suites at The Datai Langkawi, including the five-bedroom The Datai Estate Villa, offer breathtaking views of the surrounding nature. Elevated among treetops, set in the very heart of the rainforest or located directly on the coastline, the dining outlets, which include the award-winning The Gulai House as well as The Pavilion, The Dining Room and The Beach Club, pay homage to the exotic flavours and culinary traditions of the region. Leisure facilities include two swimming pools; a state-of-the-art fitness centre; an array of wellness activities; the award-winning spa and Els Club Teluk Datai - the most scenic golf course in Southeast Asia designed by golf legend Ernie Els. The Datai Langkawi is managed by Themed Attractions Resorts & Hotels Sdn Bhd, an investment holding company incorporated to develop, manage and operate hospitality and attraction destinations. DETROIT, Dec. 18, 2018 /PRNewswire/ -- Little Caesars Pizza, the third largest pizza chain in the world, will open its first restaurant in the Philippines in January 2019. The global pizza brand, which is currently operating in 23 countries and territories, is continuing the expansion of its international footprint with new restaurants in Southeast Asia. The franchisee, Palmtree ph Foods Corp., is owned by James Kodrowski. Kodrowski, also manages a group of companies that operate in the region. The first restaurant to open under the new franchise relationship will be located at the Metrosquare Building in Manila. Additionally, Little Caesars Pizza will open its first location in the Republic of Singapore in January. "We're excited to bring Little Caesars to the Philippines as we believe the country is a perfect fit for our international expansion due to its strong affinity for both pizza and value," said Paula Vissing, senior vice president of International for Little Caesars Pizza. "James Kodrowski is an experienced restaurant partner with strong market connections and the insight needed to bring our unique pizza offering to our Philippine guests who love freshness, quality, and taste." Quick-service restaurants (QSR) have long been a favorite of pizza lovers in the United States. Based on a nationwide survey of QSR consumers in the U.S., conducted by Sandelman & Associates that concluded in 2017, Little Caesars was the "Highest Rated Chain Value For the Money." The popularity of QSR restaurants also extends to international guests that are in search of delicious, affordable, quick-service meals. "Little Caesars Pizza is exactly what this market needs," said Kodrowski. "We believe that the HOT-N-READY® concept will have undeniable market appeal, as well as our commitment to excellent guest service, and superior value. It is our ambition to make Little Caesars the new favorite pizza of the Philippines." HOT-N- READY means pizza hot out of the oven ready when you are. No need to call ahead, no need to wait and no limit! With Little Caesars HOT-N- READY pizza, you get the convenience of going in and out in 30 seconds or less. In addition to convenience, Little Caesars Pizza is known for its affordability, and being named "Best Value in America" for 11 years consecutive years. ** The new restaurant in the Philippines will offer a large HOT-N- READY classic pepperoni or cheese pizza, as well as several other delicious offerings. Headquartered in Detroit, Michigan, Little Caesars® is the largest carryout-only pizza chain in the United States*. Founded in 1959 as a single, family-owned restaurant, Little Caesars® has become the third largest pizza chain in the world** with stores in 23 countries and territories worldwide, including in each of the 50 U.S. states. *** Highest-Rated Nationally Distributed QSR Chain – "Value for the Money" based on a nationwide survey of quick-service restaurant consumers conducted by Sandelman & Associates 2007 – 2017. LOS ANGELES, Dec. 18, 2018 /PRNewswire/ -- On December 18th, China's Xiamen Airlines officially launched its Davao to Quanzhou direct flight, marking the opening of Davao's first direct flight route to Mainland China. The new flight service is set to provide a bridge in the air for the economic and trade exchanges between Davao and Jinjiang of Quanzhou as sister cities. Quanzhou, one of the three central cities in China's Fujian Province, holds the distinction of being the only UNESCO-accredited starting point of the Maritime Silk Road. A large number of ethnic Chinese in the Philippines trace their ancestry to Quanzhou as well. Davao, the third largest Philippine city, is one of the leading cities in the country in terms of interaction with China. In October, the Consulate General of the People's Republic of China in Davao officially opened. At the inauguration ceremony, China's foreign minister Wang Yi specifically introduced Xiamen Airlines' Davao-Quanzhou flight route, stating that it "is set to inject fresh vitality into the development of Davao and the southern part of the Philippines." In November, Davao and Jinjiang of Quanzhou were paired up as sister cities, creating a solid platform for both cities to deepen goodwill cooperation and exchange on all fronts. The opening of the flight route not only provides ethnic Chinese in the Philippines with a fast and convenient "through bus in the air;" it also significantly facilitates business travels between China's Fujian Province and Davao, and is expected to boost economic, trade, cultural and tourist exchanges between the two regions. In recent years, Philippine President Rodrigo Duterte has met with Chinese President Xi Jinping on six different occasions, and the cooperation between the two nations in tourism, culture and education has produced fruitful results. On November 20th, Chinese President Xi Jinping paid his first visit to the Philippines, opening a new chapter in the relations between the two nations. At present, China is the largest trading partner, destination of exports and source of imports for the Philippines and second largest source of tourists for the Philippines. Private-sector investment between the two nations has surged and cultural exchanges have sharply increased; in addition, more and more Philippine fruits are finding their ways to the dining tables of Chinese people, and more and more Philippine attractions are included into the itineraries of Chinese tourists. Xiamen Airlines opened direct flights between Manila and Xiamen as early as November 1st, 1986, making it one of the first Chinese carriers to offer direct flights between China and the Philippines. In recent years, Xiamen Airlines has devoted a greater part of its transportation capacity to the Philippines, providing vital air transportation support for the exchanges between the two nations on various fronts. Before the opening of the Davao-Quanzhou flight route, Xiamen Airlines' flight network covered three Philippine cities – Manila, Cebu and Kalibo, with six flight routes – Manila-Xiamen/Quanzhou, Cebu-Xiamen/Fuzhou, and Kalibo-Hangzhou/Fuzhou. These flights routes connected to all major cities across China. There were 34 flights a week on these routes, with an accumulative total of 7,690 flights and nearly 1 million passengers, giving Xiamen Airlines the largest share of the commercial flight market between the two nations. Going forward, Xiamen Airlines will devote greater resources to flights between the two countries to create a flight network that offers regular services between major Philippine cities and China's Fujian, Beijing and Hangzhou, which are the bases of Xiamen Airlines. This is expected to further facilitate the economic and trade exchanges between the nations. With 34 years of robust growth, Xiamen Airlines, a member of SkyTeam, now ranks as China's fifth largest carrier, boasting a fleet of 210 aircrafts. As the only Chinese carrier with a 31-year track record of profitability, Xiamen Airlines is hailed as the "epitome of the development of China's civil aviation industry." Ever since its inception, Xiamen Airlines has been making unremitting efforts to ensure flight safety and enhance service quality. 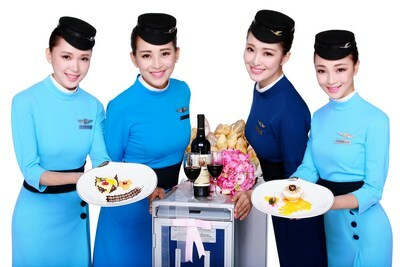 For six consecutive years from 2012 to 2018, Xiamen Airlines was rated by Chinese passengers as the "Best Airline Company" in air service. In March 2016, it received the second China Quality Award, becoming the first company in the nation's service sector and the only Chinese airline to win this prestigious accolade. While pursuing growth, Xiamen Airlines remains committed to charitable causes and diligently fulfills its corporate social responsibility by carrying out poverty relief programs, offering financial assistance to needy students, providing voluntary services and promoting energy conservation and emission reduction to protect the environment. On February 15th, 2017, Xiamen Airlines entered into an agreement with the UN at its headquarters in New York, becoming the first airline in the world to collaborate with the UN in support of the Sustainable Development Goals. Since 2015, Xiamen Airlines has opened 11 intercontinental flight routes to Amsterdam, Sydney, Melbourne, Vancouver, Seattle, New York, Los Angeles and Paris. Its flight network now covers Europe, North America and Oceania. Going forward, Xiamen Airlines will continue fulfilling its mission of "touching the hearts of its customers, facilitating the professional success of its employees, and giving back to society." It is committed to delivering the ultimate flight experience to passengers. Thales's AVANT IFE system provides passengers with a highly personalized inflight entertainment experience with a robust selection of features and applications. This new fleet will also fly with GX connectivity solution offering seamless, high-speed broadband internet to their passengers. SINGAPORE, Dec. 18, 2018 /PRNewswire/ -- Singapore Airlines is known globally for its high standards of service and cabin experience. The airline has been awarded the internationally acclaimed five-star rating from Skytrax and was recognized by the organization in 2018 as the 'World's Best Airline" for the fourth time, operating a modern passenger fleet of more than 100 aircraft. For the upcoming fleet of A350-900 medium haul aircraft, Singapore Airlines has entrusted Thales to sustain their brand promise of improving service excellence, retaining competitive advantage and continuing to meet and exceed customer expectations. Singapore Airlines and Thales celebrate the entry into service of the airline’s new medium-haul A350-900 aircraft. Singapore Airlines announced Adelaide as the launch point of its new aircraft commencing operations December 17, 2018. This new fleet of aircraft will be equipped with Thales's AVANT IFE system, featuring an innovative and personalized user experience uniquely designed for Singapore Airlines. The 40 Business Class passengers will enjoy 17" High Definition touch screen monitors with a complementing handset that operates similarly to a consumer smart phone, enabling passengers to use it as a secondary device to control the seatback monitor. The 263 Economy Class seats will feature the latest 11.6" touchscreen monitors. Air Mouse (available in Business Class): The touch screen handset functions as a remote control by directing the onscreen cursor on the seatback monitor. With Singapore Airlines' myKrisWorld complementing the new IFE system, passengers are able to enjoy a personalized inflight entertainment service with over 1,800 movies, television shows, music, interactive games, informational applications and more. KrisFlyer members and passengers traveling in premium classes will also have access to additional content. Passengers will be able to personalize preferences upon sign-in and bookmark partially watched movies and TV shows to be resumed on subsequent flights. Passengers onboard Singapore Airlines' new A350-900 medium-haul aircraft will enjoy high speed WiFi service using Inmarsat's Global Xpress (GX) satellite network. The pairing of global Ka-band connectivity and Thales's latest IFE innovations provides a comprehensive set of onboard entertainment services that transform passenger experiences wherever they fly. To ensure that the IFE and Connectivity systems remain at optimal performance, Thales will also provide turn-key maintenance support and services through its FlytCARE service, including line maintenance, software and media content loading, repairs and support from the Singapore Customer Support Center. "At Thales, we are committed to enriching and expanding Singapore Airlines' passenger experience through the digital transformation of airline services," said Philippe Carette, Chief Executive Officer, Thales InFlyt Experience. "Singapore Airlines leads the industry in aircraft innovation and we are proud to be partnering with them to create the ultimate inflight experience for their customers." "Innovation has always been at the forefront for Singapore Airlines in delivering the best experience for our customers. Through this partnership with Thales, we are excited to equip our new A350-900 medium haul aircraft with the latest IFEC innovation systems to reinforce SIA's product leadership and ensure a differentiated experience for SIA customers," said Senior Vice President Customer Experience Mr Yeoh Phee Teik. The people we all rely on to make the world go round -- they rely on Thales. Our customers come to us with big ambitions: to make life better, to keep us safer. Combining a unique diversity of expertise, talents and cultures, our architects design and deliver extraordinary high technology solutions. Solutions that make tomorrow possible, today. From the bottom of the oceans to the depth of space and cyberspace, we help our customers think smarter and act faster - mastering ever greater complexity and every decisive moment along the way. With 65,000 employees in 56 countries, Thales reported sales of EUR15.8 billion in 2017. With strong roots in the Singapore market and over four decades in the region, Thales has developed an impressive local presence, innovation capability and business partnerships across the region.